With years of gable vent installation experience, our team has implemented many upgrades. A simple extra bend in the aluminum sheet can strengthen the louver by more than a 3 foot spans. Thus, our 4 fold louvers are capable of spanning a full 10 foot before any center brace is required. This does cost us more in aluminum, but gives you the full assurance of a durable gable vent where the louver stand straight even in flooding rains and high winds. It is also noticeable of the double hem on the back of the vent louver. By adding strength to the rear of the slat we are also taking some stress from the front of the louver relieving the possibility of sagging. 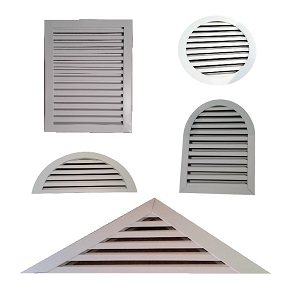 No other gable vent louver is manufactured to this quality. Taking the process a step further, the louver ends are notched to wrap around a rail in the frame. The rail is a fully enclosed rectangle frame for the louver to attach to. By wrapping the end of the metal around the rail / frame, the louver end is permanently secured and pop riveted in place. After years of rattling in the wind and weather, a pop rivet can wallow out and release. Then the louver falls out. This process ensures the stability of the louver attachment for a lifetime. Wind shear has been an enemy of gable vents for many years stressing the fasteners and vibrating the vent slats to the point of pre aging the vent. A gable vent should be installed once and done. Not every few years for poor, cheap quality. This is why we added a wind shear buffer to the rail system and louver ends. 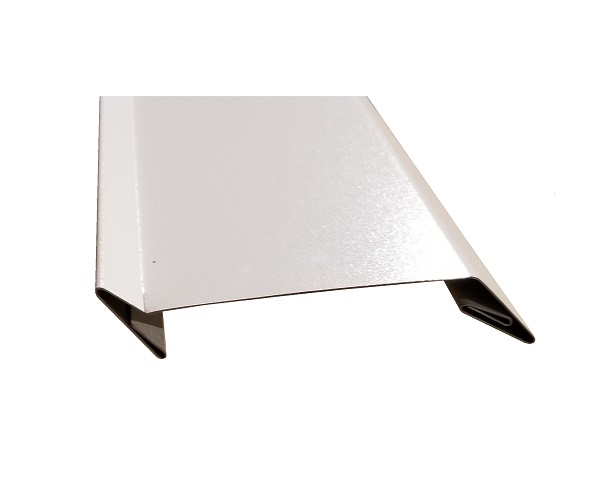 This buffer is a rubbery vinyl application to prevent the excess vibration of the gable vent. This process has extended the gable vent life by more than another 20 years. To ensure a great fit every time, the vents are made 1/2 inch smaller than ordered unless specified as tip-to-tip for the measure. The 1/4 inch gap around the entire gable vent is for the natural expansion and contraction of the wood frame of the house or building it is installed in. To compensate for the slight gap, the front flange covers a full 1 1/2 inch around the vent. Or it might be preferable for a back flange. We also supply as options of the no flange and the j channel flange. The gable vent install process should be as easy and matched to the specs of your home or project. These flange options are a neat way to hide the vent frame and pop rivets to ensure a nice clean gable vent and installation. If you wish, the side walls of the vent is triple walled so placing a screw through the side behind a louver can hide your fasteners too. If all this technology was not enough, there are too many color match options to list. After purchasing such a large item, there should not be an extra expense or waste of time painting the vent unless the color match is not available in any aluminum. We order from all coil manufacturers to ensure the vent is made in the same color. Want it soon? Most all gable vents are shipped in 1 to 2 weeks and by Fed Ex. There is no need to wait a month to 6 weeks on a product to finish the job.